Part of Forum Health’s five-year master facility plan included Trumbull Memorial Hospital’s new Regional Oncology Center, located across the street from the main facility. To provide easy access to the new stand alone radiation oncology center by staff and patients, a skywalk was installed between the two buildings. A Continental® pedestrian truss walkway was selected to meet the specifications provided by the architectural and consulting engineering firm of Baker Bednar & Associates. 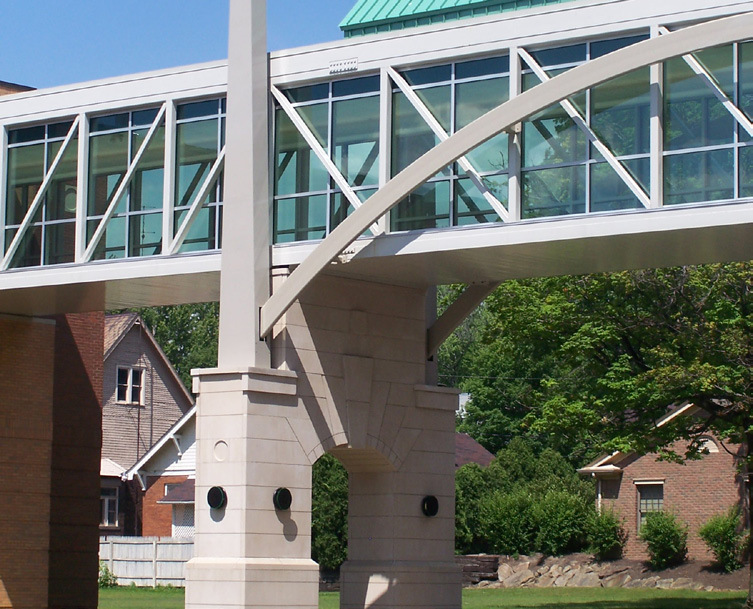 Coined “The Gateway to Warren,” the skywalk spans East Market Street in Trumbull County, Ohio, connecting the third floor of the oncology center with the hospital’s second floor. The new skywalk, with its bold arch and stonework support pillars, features solar green glazing and a unique roof treatment. It utilizes a cast-in-place concrete floor that was covered with a durable and slip resistant rubber covering.